Recently I had a case where a 61 YO female underwent axillary mass excision. The patient had significant comorbidities, including non ischemic cardiomyopathy with EF estimated at 20%. The patient had undergone multiple anesthetics in the past without problems. The patient had a Boston Scientific AICD placed in 2011. I have written on this topic in the past and noted that typically Boston Scientific AICDs, require auscultation to determine if magnet placement has discontinued the 'anti tachycardia therapy'. In discussing this with the sales rep of the device, he stated, that as of 2006, all AICDs were programmed to turn off when a magnet was placed over the device, and resume regular function when the magnet was removed. Therefore, we elected to place defibrillation pads on the patient and turn off the anti tachy arrhythmia function of the AICD with a magnet and proceed to surgery. The surgery was uneventful and the patient emerged from anesthesia after an uneventful anesthetic. In the Fall APSF newsletter, the front page article featured information regarding CIEDs. It was emphasized that practitioners must understand what kind of device the patient has and how it is expected to function. There are three main categories of CIEDs: pacemaker, ICD, and devices that also perform resynchronization therapy (CRT). This latter category is important because these are patients with significant cardiac dysfunction, and it is important to maintain the normal function of this device during the anesthetic. Fortunately, placing a magnet over this type of device will only inhibit the anti tachycardia therapy portion, and its pace making capabilities will function normally. However, if this patient is pacemaker dependent, either the device will need to be reprogrammed into a VOO mode, or, electrocautery will need to be limited. In most cases, all pertinent information can be gained by interviewing the patient or having a chat with their cardiologist. In some cases, however, information may not be available. In some instances, a chest X-ray may be indicated that may provide information that can be used to determine what kind of device you have and what needs to be done if anything. The clinical circumstances will dictate the necessity of of a chest x ray which is almost guaranteed to delay a roll back to the OR. For example, if surgery is distant from the generator (i.e. below the umbilicus), or if surgery is performed with a bipolar electrocautery unit, no changes in the device are likely needed beyond determining what the indication was for placement and verifying that it is functioning (i.e. the patient has had regular follow up with an EP clinic). 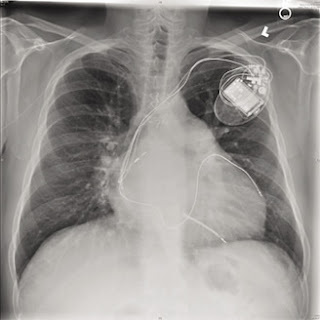 Patients who present to surgery with an ICD who also are pacemaker dependent present unique challenges. Placing a magnet over the ICD will disable anti tachycardia pacing and defibrillation, but the pacemaker is unaffected and thus remains vulnerable to EMI interference from an electrocautery unit. In this case, the surgeon will need to be notified that bipolar electrocautery is optimal to avoid interference with the pacemaker function if surgery is the in the chest or near the pacemaker generator. If not, monopolar cautery can be used, but in short bursts to avoid prolonged interference. Alternatively, if available, the unit should be reprogrammed to address issues (i.e. disable the anti tachycardia and bradycardia therapy). If an x ray is required to make a determination of what type of device the patient has, the following clues will be important. In the above image, note there are THREE leads, a right atrial lead, a right ventricular lead and a coronary sinus lead. Careful observation of the right ventricular lead allows notice of a thicker design than the other leads, which represents the shocking coil of an AICD. The 3rd lead (or coronary sinus lead) suggests that this is for CRT for low ejection fraction. In the above image, this patient came to surgery for emergency laparotomy. She stated that she had a 'pacemaker' placed one month ago. She was unsure of any of the details and family wasn't available. 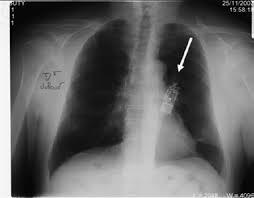 The above chest x ray indicates that this is not a pacemaker however, as there are no leads. This is an implanted cardiac loop recorder. Below, a dual chamber PM next to an AICD for comparison of difference. Note that both the dual chamber PM and the AICD have a left atrial and left ventricular lead, but the left ventricular lead has a long radio opaque coil for electroshock delivery . Note in this image the thick coils for to deliver electroshock in both the SVC and RV, plus an additional lead in the LV indicating the ability for resynchronization therapy. In many patients with low EF, resynchronization therapy is utilized to improve ventricular function. In most cases, these patients will have three leads, Atrial, and two ventricular. However, in patients in chronic persistent atrial fibrillation, the electrophysiologist will only insert two ventricular leads and pace the ventricles only. Therefore, only two leads are used and will be visible on chest X ray. No coil will appear if no AICD is used. Since patients who qualify for a biventricular pacemaker for resynchronization therapy have also traditionally also qualified for an AICD, it is unusual to see a biventricular pacemaker only. However, recently, the indication for a biventricular pacemaker have changed and a larger number of patients are receiving these devices despite an EF of >40%. In the end, carefully evolution of the chest X ray will always answer the question in patients who are unsure. Although devices implanted after about 2005, are very user friendly, patients may still present with older devices. In this case, a thorough understanding of how they will respond to a magnet is important and therefore, it may be prudent to call a 24 hour tech support line. Note: Boston Scientific purchased 'Guidant'.